Fake Industries Architectural Agonism (Urtzi Grau and Christina Goberna) participated in the 2011-2012 Shenzhen Biennale, China. 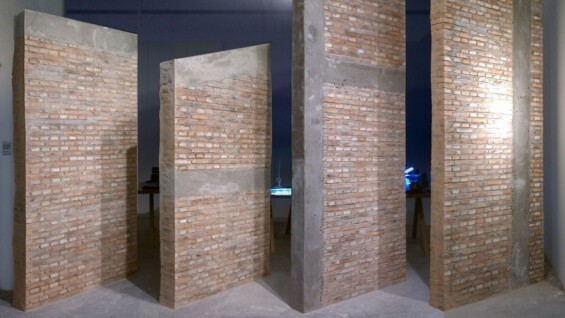 The Biennale titled The Presence of the Past, consisted of several curated exhibitions. Fake Industries participated in The Street, curated by Terence Riley. Designed by the 12 architects selected by the curator in consultation with leading critics worldwide, the installations and facades create the "street" even as the "street" provides the structural basis of the architecture. Architecture Creates Cities. Cities Create Architecture. Unlike the 1980 Venice exhibition, however, the architects of The Street have been encouraged to design facades - or, as it has turned out, non-facades - that are spatial and material rather than two-dimensional. Image credit: Fake Industries. Four panels stripped out from the façade of Ai Wei Wei's studio the night before it was demolished.